I love to organize. It makes me happy inside and out to tackle a project - big or small - and end up with a neater, more functional space. This project definitely falls into the small category, but small things can make a big difference! 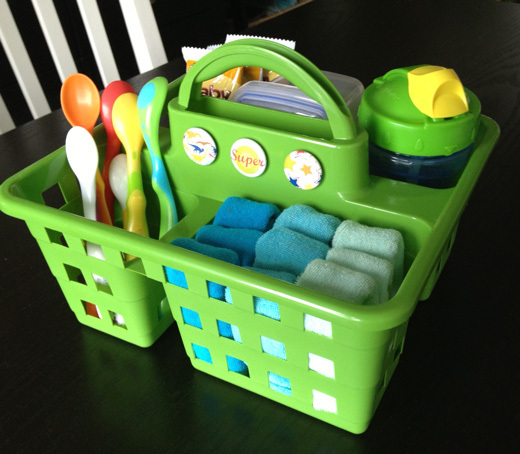 When it comes to meal and snack time, there are a few staples we always need handy for our 10 month old little guy - sippy cup, rice snacks, spoons, wash cloths, to name a few. Our dining room table was getting a bit cluttered with all of the things we needed to have within reach. 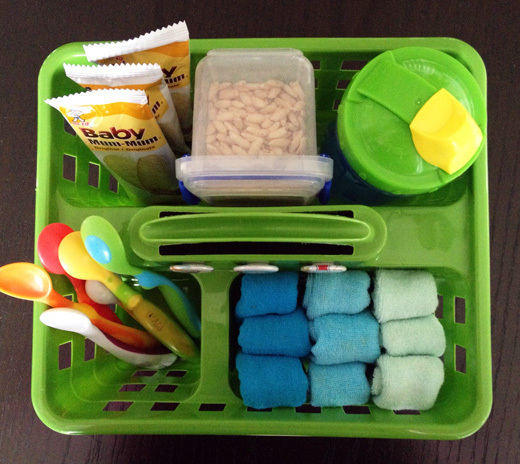 I decided to put together a little caddy to keep all of his essentials organized and close at hand. 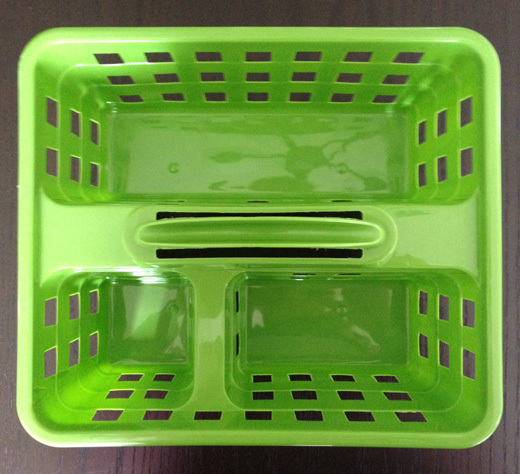 I bought this great little divided basket at the dollar store for $1.25. It turned out to be the perfect size for what I needed. I love it when that happens. I wanted to make the basket more personal, so I went digging through my sticker collection and came across these fun, adhesive-backed buttons. I had purchased them on clearance for a mere 70 cents awhile back, but had totally forgotten about them. 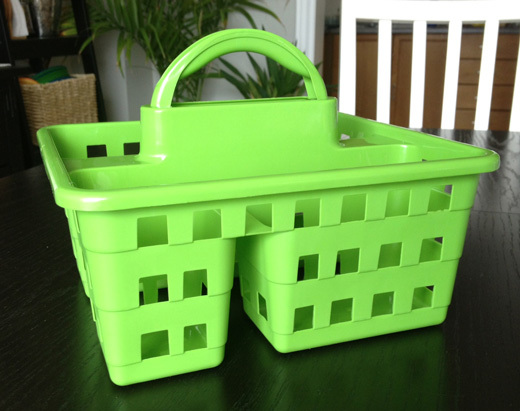 I was so pleased to rediscover them - they were perfect for this project! Once I stuck the buttons on, I went to work filling the caddy with all the essentials. 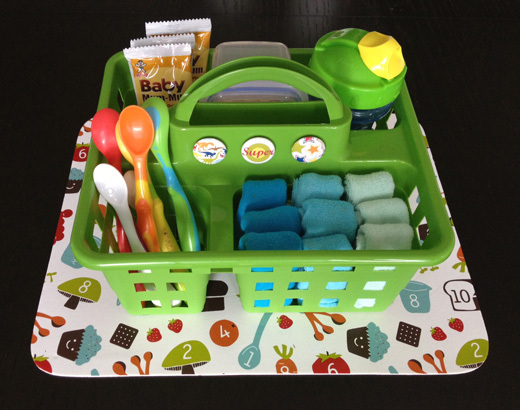 It's fun, organized and even matches my little guy's place mat! We just use a booster seat instead of a high chair in order to save space in our dining room. The caddy is the perfect size to fit on the booster seat tray or over the back of his chair when not in use. Organization. I love it! And all for less than two dollars! Please visit my Link Parties page and check out where I'm linking up this week. Great idea! Anything that simplifies life is a great project! Thanks Randi! Yes, anything that makes life a little simpler is a great thing! How nice to have everything right at your hand. Makes for an easier meal and snack time!! Thanks Carrie! I just linked up. Hope your first link party is a success! Oh LOVE this idea!!!! The daycare that my daughter attends has a similar system.. but not as cute!!! Hi my beautiful Heather...when I first saw this, I had no idea that it was from the dollar store...the buttons make it look almost customized. Where were you when my kiddies were little? Thanks Lucy! Glad you like it. I LOVE to be organized. I'm getting there, one little project at a time! Thanks so much for linking this up at our very first "Think Tank". You have been featured!! 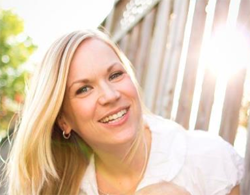 Wow, that is so exciting to be featured! Thanks Carrie! Couponing - a whole new world! Homemade thankful rolls - yum!